Excellent article in today’s (3 November) Guardian about Hard Case Crime and whether or not they can solve the mystery of digital publishing. Whilst I am not going to get into a discussion about this I can only say that they publish some bloody good books! I am really pleased that they did not hit the dust when Dorchester decided to pull the plug on publishing paperbacks and that they have found themselves new a new publisher here in the UK. At least now it will be easier for me to get my hands on the books. The covers are divine and the stories even better. If you have not read any of them, where have you been? According to Galleycat Janet Evanovich is looking for some co-authors. The full article can be found here including how to submit! Brad Pitt is according to the Hollywood Reporter to team up once again with director Andrew Dominik in the film version of George V Higgins comic crime comedy Cogan’s Trade. Dominik directed Pitt in the film The Assassination of Jesse James by the Coward Robert Ford. Pitt will also produce. According to the Bookseller the Ian Fleming Estate are to sell the James Bond e-books directly themselves bypassing Penguin. 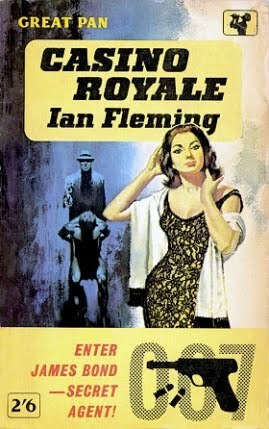 The books are to be published by Ian Fleming Publications. The full article can be found in the Bookseller. Could this be opening a can of worms?